Salem resident Bob Murch is arguably the world's foremost Ouija Board expert. At least in the movies, Ouija Boards make calls to dead people. But that wasn't the case for Bob Murch, a perfectly live man, who picked up a call years ago from the world of Ouija and has been holding on ever since. The history of the controversial game, often thought to be played by folks seeking evil spirits, has a strong grip on Murch, compelling him to spend most of his free time tracing its origins and collecting boards. To the tune of 300, currently locked in his Salem cellar. However, using spirit boards, talking boards or Ouija boards for what they're intended - conjuring the dead - doesn't seem to interest Murch in the least. "I didn't use one for years after I started to collect," says the 29-year-old Ocean Avenue resident. "It was always the history. It was always finding out more." His feverish research attempts have made Murch something of an expert on Ouija Boards and, arguably, the world's most learned fellow as to their history, which, in turn, has pushed him into the spotlight of the national media more than once, joining ranks with other spooky and witchy friends of Salem. To enter Murch's clean and cozy condo doesn't feel like breaching the front gates of someone jazzed on the occult. But then, his wiry cat, Merrick, named after a character in Anne Rice's Vampire Chronicles, jumps up to cast a spooky eye. And there's an Alaskan something or other hound chained in his basement. Then his cell phone rings out micro-chipped rendition of the theme from the movie "Halloween." "How fitting was that?" Murch giggles. A clean-cut, baby-faced financial researcher at Fidelity in Boston by day, Murch has always possessed an inexplicable attraction to the occult, er, "mysticism" (he corrects himself). Or maybe to the "supranatural" he decides. Like Salem's confusing attempts at defining the word "witch" as a ciyt, Murch can't exactly say what draws him. Raised on the North Shore as an orthodox Jew, Murch says spirituality was a real part of his family, especially sensed when around his grandmother, who was something of a character and a major influence on his life, forced him as a young child to watch scary movies with her. This matriarch also told him she moisturized her legs because she was an alien. Murch had a real love for the woman he called his "Shiny Legs." When his rabbi told him that God was with him at all times, Murch slept on one side of the bed for years to come, as not to squash God. Basically, whatever you wish to call it, it runs in the family, he says. "Someone knows what you will say before you say it," he elaborates. "Someone is humming a tune and you turn on the radio and there it is." This spookiness, a rabid thirst for his Ouija hobby and, perhaps, for history, has carried Murch into an obsession that drives him. Sometimes to the point of madness. It has also, however, led him to some super cool gigs - like acting as a technical consultant on the set of the 2000 thriller "What Lies Beneath," starring Michelle Pfeiffer and Harrison Ford, for the movie's Ouija Board scene. The director took his advice, says Murch, to keep it light, unlike some other movies that come across looking lame rather than scary. Ouija Boards, for many, represent that first flirtation, Murch says, with the other side. "It's the thought that there's something else out there. It's not just you die and that's it. In the blink of an eye, your life is gone. It's exciting that there's a chance that an easy game would allow it not to be over." Turning to a line of, collector's edition, framed magazine covers adorning his wall, Murch points out the romanticism of Ouija Boards, as young men and women of the 1920s, in the flicker of firelight, placed their fingertips together on the planchette, or movable disk that searches for the answers to questions asked of the board. Not until movies like "The Exorcist" gave the game a bad name were Ouija Boards seen as so evil, he explains, pointing out an original "Saturday Evening Post" cover by Norman Rockwell of two innocent teenagers playing the game. When looking to pick up new boards in New Hampshire or Maine antique stores, Murch has learned not to ask the $64,000 question because his answer is often: "No, I don't and if I did I would burn it!" "Well for God's sake don't burn it," Murch says theatrically. "I'm trying to save these things." The boards don't sell because of their reputation for talking to the dead, says Murch. "It isn't that people don't like them because they think they don't work," he explains. "It's because they think they do." The boards sell like hotcakes during times of trouble - wars, depressions, recessions and times of general despair. "Disasters and boards go hand in hand," says Murch. "People want to know what's going to happen, especially when things go bad." One fascinating aspect of Ouija boards is that their design always reflects the times. In the 1920s, Americans associated the Middle East with "exotic," so companies churned out boards with turbans and swamis. In the '60s, astrology was cool and the boards featured stars, numbers and girls with cool hairdos. "The board has existed for this long because it's the only game that is a chameleon," says Murch. Pouring over a few of Murch's cooler and more antique boards, which incidentally look like serving trays at an outdoor picnic, is like peering into the minds of toy marketers sitting around a conference table. The knock-offs are hilarious: Ouija Queen, Raja Far East Talking Board, Black Majic Board, We-Ja Girl. Everyone tried, until they got sued for creating something too close to the real thing, he says. To many serious historians, the Ouija Board is nothing more than pop culture. But Murch reveres their story as a sacred tale, worthy of being passed on through the generations. The perfect life for Murch would be to quit his day job and curate a collection of his boards in a museum. 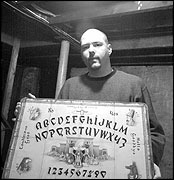 Meanwhile, he would oversee the business he started in 2000 when he designed and began marketing his own spirit board. Salem's version of Monopoly, Cryptique, the game uses graphics based on Salem Old Burial Point, intended to summon the eerie atmosphere of a graveyard at midnight. A local graphic designer lifted a winged skull right off one of the cemetery's headstones to complete the product. When the game launched, it was Amazon.com's No. 1 seller. It can now be found at the Witch's Museum, several Salem stores as well as Amazon and Toys R Us online. Murch's friend and Salem witch Christian Day designed Cryptique's website and helps market the game. "Through this doorway is revealed a glimpse of our darkest superstitions and deepest fears," the website reads. "The tomb of Cryptique beckons the curious to sit spellbound and discover the mysterious realms of the unknown." "The Ouija Board brings death to the masses," Day says with tongue firmly planted in cheek. "You too can explore death in the comfort and safety of your own home." While Murch brings his vast knowledge and obsession to the operation, his partner in business (and life for the past nine years), Gary Halteman, adds the grounding and business savvy it takes to run a company. Likewise, Murch's exhaustive efforts have also thrust the researcher firsthand into the story he has so obsessively chased, playing Murch right into the hands of the Fuld family, who founded the Ouija Board game as we know it in Baltimore in the early 20th Century. The Fuld family made rocking chairs, doll furniture and pool tables. But their legacy is the Ouija Board. Though the boards have had many incarnations over the years, the name "Ouija" has stuck just like Roller Blades for inline skates or Zerox, Band-Aids or Kleenex. Murch and Kathy Fuld, granddaughter of the game's inventor, talk on the phone every couple of weeks now and the pair has vacationed together with their respective partners. "We're good friends and like soul mates," Fuld says. "He and I just think so much alike all the time." One of the first things Murch said when he met Fuld was that she must have had the most interesting life, growing up in the family who started the Ouija Board. But Fuld says her dad went to work at the toy and game factory just like everyone else goes to work and she didn't think it was anything special. "I never understood why (Bob is) so interested," she says. "I've learned so much more about the company from him." Fuld has given Murch many things from the family's collection of memorabilia, including a pair of gold cuff links that say "Ouija." Murch has become so close with the founder's granddaughter, that he and Halteman were recently pallbearers in a family funeral. He feels protective of Kathy Fuld, now his dear friend, wanting to guard her from those who target her, alleging the Fuld family found a way to commune directly with the devil. Murch pays regular visits to Fuld in her Baltimore home and helps her sort out family papers, since he understands the trademarks and the business of Ouija boards better than the descendent of the game's founding father. In fact, the founding father's 8-x-10 framed photograph has a prominent place on Murch's wall and remains one of his most treasured possessions. Photographs of Kathy Fuld with her family members are placed prominently on the wall, where Murch's own family photos might ordinarily go. Their connection originated, as most do these days, electronically. Many aficionados were contacting Murch through his website that functioned as a de facto museum of his boards. What started out for Murch as a search for boards in thrift shops and antique stores and later online, became cottage industry of simply accepting boards people offered him: the Ouija Board guy. Just when he would tell himself it was time to stop delving deeper, a letter or e-mail would arrive and take him further. In 1997, the path twisted in a most unexpected direction. Kathy Fuld left Murch a message in his site's online guest book, seeking more information about her own family, who had been divided by a mysterious feud, involving the Ouija Board. Murch's initial research had told him this "granddaughter" could not exist. He asked Fuld some questions only a family member (and Murch) would know the answers to and she passed the test. Through e-mails and phone calls, it was Murch who patched the relationship between Fuld and a cousin she never knew existed, who had also contacted him, independently. The two had been told their whole lives never to speak to the other side of the family. "It was the Ouija Board that ripped the family apart and the board that put them back together again," says Murch, thoughtfully. Cryptique was actually born of Fuld and Murch's musings about how they could create a better board since her family sold the game to Parker Brothers in 1966, against her grandfather's dying wish following a freak accident in 1927. The company watered Ouija down, they feel, making it more for appropriate for teenaged slumber parties than actual spirit conjuring. To those who say Ouija Boards have nothing to do with Salem, Murch rebuts with not only the squishy response ("but it's spooky Salem - get it? "), but with historical facts. Parker Brothers (now owned by Hasbro), which still manufactures Ouija Boards, opened what became its primary U.S. manufacturing plant on Bridge Street in Salem in 1888. The facility, a converted laundry service building, was a booming three-shift plant by the 1930s, even during The Great Depression's deepest depths, and housed equipment until 1994, when the company's post-buyout headquarters shifted to East Longmeadow, Mass. Parker Brothers also maintained a corporate headquarters in Beverly on Dunham Road from 1977 until 1999. But in line with many of the city's efforts to stifle all that is spooky about the community, Murch laments, Salem let the Parker Brothers building be knocked down. 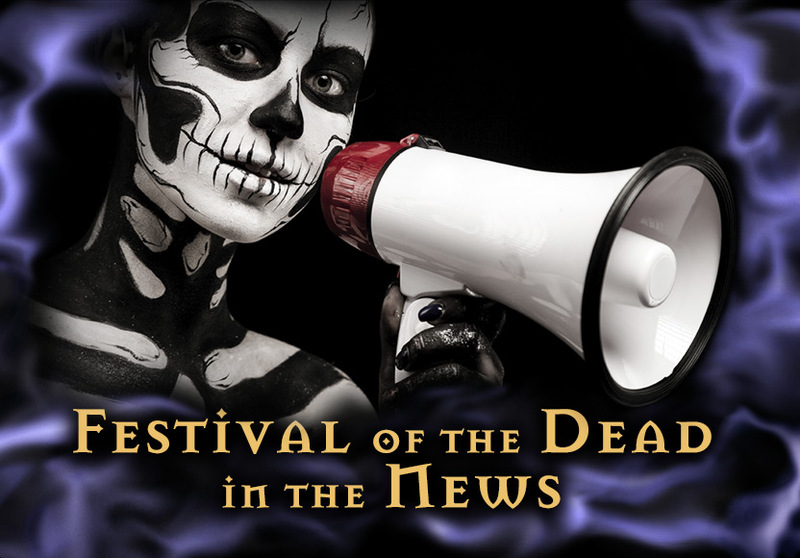 Murch's passion brought Fuld to Salem last weekend to kick off the first annual Festival of the Dead (see adjacent story), during which she joined Murch in a educational evening dedicated to the Ouija Board at the Lyceum restaurant. Every time she sees Murch, Fuld asks him why he's so obsessed with her family. Every time, he really doesn't have an answer. And not yet 30, he reckons he's got years to obsess over the Fuld family, he notes with a chuckle. "It's really sad," he shakes his head. "It's an awful lot of time ... Oh God."